One of the consistent drivers in all businesses is ‘cost take-out’. One area of considerable expense to the majority of consumer facing companies is incoming customer phone calls. Significant advances have been made in streamlining the processing of these interactions; ‘Soft switches’, IVR’s (Interactive Voice Response) and voice recognition technologies, for example. Due to the significant number of North American’s actively using email (44% multiple times a day and just over 80% a few times a week), the next wave of efficiencies in handling incoming consumer communication, is the massive cost saving opportunities in converting these calls to incoming email. Most queries do not require an immediate response. Consumers are comfortable waiting up to 12/24 hours for a billing response for example, as long as they are guaranteed that they will in fact get a response within this time frame. It is far quicker to send a query via email, than it is to navigate an IVR and / or talk to a CSR. The consumer will get an immediate ‘auto-response’, giving assurance of a further expected response and an escalation path should the required response not be satisfactory. The consumer will also be issued a ‘ticket number’, allowing both parties to efficiently track the query. Consumers are able to submit queries 24 hours a day, even if your Contact Centers are not open at that time. Queries are received without the need to have as many CSR’s available to ‘man’ live calls. As you have between 12 and 24 hours to respond, the call volume ‘peaks and troughs’ can be reduced within your contact centre. Responding to an email query is up to 40% faster than taking an incoming call, thus making your CRS’s that much more efficient. Tracking of a query is far more efficient due to the ‘ticket number’ process. Attaching of that query to a customer master record can be a fully automated process. Moving your customer queries to email is a continuous process that occurs at every touch point with your consumer; on their bills / statements / envelopes, an auto-message in your IVR, within your email marketing, specifically highlighted on the contact us area of your website and if you are fortunate enough to have secure email billing, then on reply to these messages. It also has the MAJOR advantage in that with every new enquiry, you have captured your customer’s email address. DO NOT require any software or hardware purchase. DO NOT require any system set-up within your organization, nor CRM or CIS integration. Can be implemented and training completed, in less than 8 weeks, irrespective of the size of the organization. Average time to response; and many more. It is achievable and expected, that through carefully planning, implementation and strategic thought, your organization could convert as many as 20% of incoming customer calls within the first year. 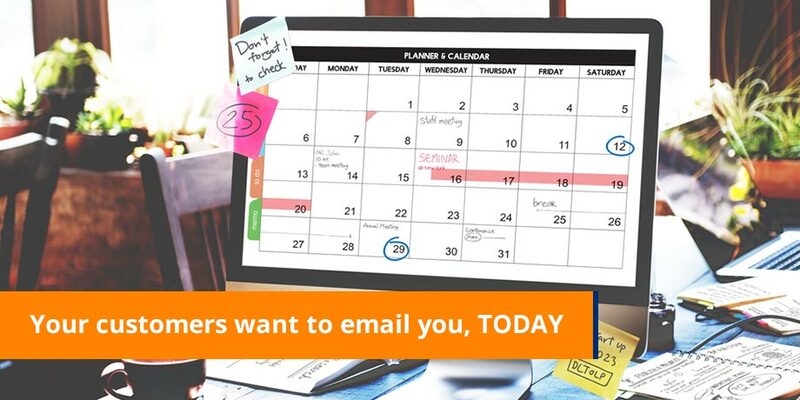 Your customers want to email you, TODAY. All organizations need to undergo the same transformation to efficiently accept email, that they did in the 80’s and 90’s to manage incoming calls. Please feel free to contact us for a detailed discussion in this regard.